Dunsparce is a Normal type Pokémon introduced in Generation 2. It is known as the Land Snake Pokémon . The effectiveness of each type on Dunsparce. In Generations 2-3, Dunsparce has a base experience yield of 75. 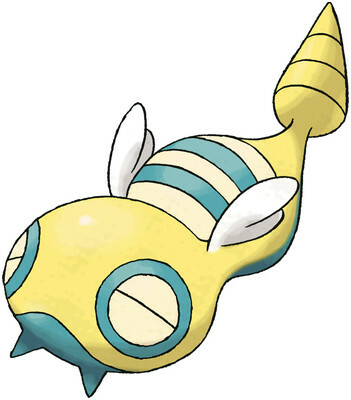 In Generation 4, Dunsparce has a base experience yield of 125. If spotted, it escapes by burrowing with its tail. It can hover just slightly using its wings. It creates mazes in dark locations. When spotted, it flees into the ground by digging with its tail. It travels by digging through the ground. Diglett and Dunsparce share one another’s tunnels happily. When it sees a person, it digs a hole with its tail to make its escape. If you happen to find one, consider yourself lucky. Dunsparce learns the following moves in Pokémon Ultra Sun & Ultra Moon at the levels specified. Dunsparce learns the following moves via breeding in Pokémon Ultra Sun & Ultra Moon. Details and compatible parents can be found on the Dunsparce egg moves page. Dunsparce can only learn these moves in previous generations. It must be taught the moves in the appropriate game and then transferred to Pokémon Ultra Sun & Ultra Moon. Dunsparce learns the following moves in Pokémon Sun & Moon at the levels specified. Dunsparce learns the following moves via breeding in Pokémon Sun & Moon. Details and compatible parents can be found on the Dunsparce egg moves page. Dunsparce can only learn these moves in previous generations. It must be taught the moves in the appropriate game and then transferred to Pokémon Sun & Moon.